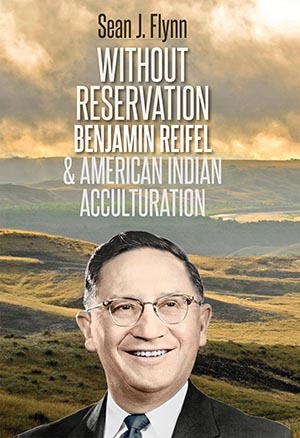 "Without Reservation: Benjamin Reifel and American Indian Acculturation” by Sean J. Flynn, professor at Dakota Wesleyan University in Mitchell, will be featured at the South Dakota Festival of Books in Brookings, Sept. 20-23. The book is the latest original biography from the South Dakota State Historical Society. As the first Lakota to serve in the United States Congress, Benjamin (“Ben”) Reifel (1906–1990) made a career of straddling two distinct cultures. He was a bilingual member of the Rosebud Sioux Tribe of South Dakota but often found his ideas challenged by American Indian activists. Throughout his life, he advocated that his people become self-reliant citizens, not by abandoning traditional values, but through education and integration. In the end, Reifel viewed himself as a modern Indian leader, versed in his native tongue and culture, college-educated and looking beyond reservation boundaries. Throughout his earlier career with the Bureau of Indian Affairs and in Congress during the 1960s, Reifel worked to bring economic success to the reservations and to South Dakota as a whole, dividing his time between agriculture policy and Indian affairs. A moderate-conservative Republican, he quickly rose to prominence on the House Appropriations Committee and, with Sen. Karl E. Mundt, is responsible for placement of the United States Geological Survey’s Earth Resources Observation Systems (EROS) Data Center near Sioux Falls. Flynn, a graduate of South Dakota State University, has served as professor of history at Dakota Wesleyan University since 1999. He is the recipient of the United Methodist Church General Board of Higher Education and Ministry Teaching Excellence Award and the Clarke Award for Teaching Excellence. A member of the Rosebud Sioux Tribe, Flynn is a descendant of the Lakota leader Spotted Tail. “Without Reservation” is available as a hardcover book for $29.95, plus shipping and tax. It can be ordered directly from the South Dakota Historical Society Press at sdhspress.com or by calling 605-773-6009. Follow the South Dakota Historical Society Press on Facebook (SDHS Press) and Twitter (@sdhspress) for more.